With a rich constellation of museums, a growing culinary scene and packed downtown super-stadiums, Cleveland—situated along the Lake Erie Shoreline—is a resilient, no-nonsense, hard-working kind of city with a rich history and a promising future. Rising stars abound here—from Iron Chef and restaurateur Michael Symon to the city's very own, homegrown NBA superstar, LeBron James. What the city lacks in size, it certainly makes up for with an impressive variety of entertainment options and cultural diversity. Areas like the Warehouse District, East Fourth Street and University Circle are bustling hubs of energy. World-class museums, such as the Cleveland Museum of Art and the Cleveland Museum of National History, and the internationally renowned Cleveland Orchestra add to a wealth of culture. A modern melting pot, Cleveland's neighborhoods are often marked by strong ethnic ties. One can live la dolce vita in Little Italy, partake in pierogi in Slavic Village or tour the Far East in the Asiatown neighborhood. 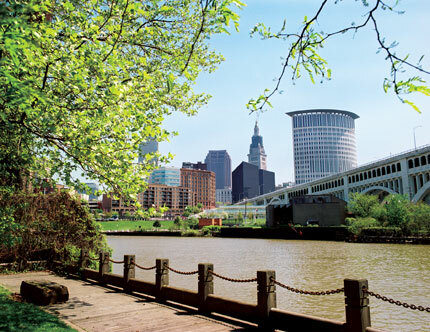 Clevelanders tend to identify themselves as either East Siders or West Siders, claiming allegiance to one side of the Cuyahoga River. In reality, each side of the Cuyahoga coin offers something special: a myriad of fine dining, intriguing galleries, late night hot spots, independent theater and a sublime mélange of shopping possibilities. In terms of getting around, the city's grid of streets and highways are relatively straightforward; with the help of a road map (and the occasional assistance from a resident), renting a car from one of the numerous national car rental agencies is a worthwhile option for those flying into Cleveland Hopkins International Airport. There's also the Rapid, an easily navigated light-rail system, and cabs are available outside most downtown hotels and clubs, especially on the weekend. Making your base at one of Cleveland's downtown hotels will put you within walking distance from a variety of big-ticket attractions, and staying at the epicenter of the city affords you relatively close proximity to East and West Side destinations. The Ritz-Carlton, Cleveland, and the Renaissance Hotel are connected to the Tower City entertainment complex, which includes over 100 specialty shops, six full-service restaurants, an 11-screen theater, Time Warner Cable Amphitheater at Tower City, easy access through a connected walkway to Progressive Field and Quicken Loans Arena, and a terminal for the Rapid. Other downtown hotels include the Hyatt Regency Cleveland at The Arcade, a National Historic Landmark located in the rapidly growing Gateway District; the Wyndham Cleveland at the famed Playhouse Square; and the Cleveland Marriott Downtown at Key Center. Each offers unique logistical advantages, depending on your interests. For instance, theater buffs will want to lodge at the Wyndham and arrange a tour of Playhouse Square's historic theaters or take in a show. For travelers keeping an eye on their lodging budget, Cleveland's downtown area offers many popular national hotel chains, including the Hampton Inn and the Holiday Inn Express Hotel & Suites, which are both located at the busy intersection of Cleveland's theater and Gateway districts, affording easy access to many attractions. The Holiday Inn Express features sizable rooms, some with striking views of the newly restored, historic Euclid Avenue. The Doubletree Hotel Lakeside is also a reliable bet and is close to the Rock and Roll Hall of Fame and Museum, Great Lakes Science Center and Voinovich Park. Further from downtown, the Brownstone Inn offers a bed and breakfast experience closer to the city center. Built in 1874, this four-story townhouse is five minutes from downtown attractions and is known to host visiting celebrities on a regular basis. The Glendennis Bed and Breakfast offers accommodations in a private 1860s home, just west of downtown in Cleveland's burgeoning Ohio City neighborhood. For a busy day ahead, you'll want to fill up on a hearty breakfast at the Waterstreet Grill on Ninth Street, a perennial hot spot, thanks to a welcoming staff and relaxed environs with plenty of windows to let in the morning sun. Expect a decent crowd on weekends, however, as it's the place for downtown dwellers to start their a day with robust sunrise sustenance. (It's also the place many regroup from late night reveling in the city's raucous Warehouse District scene, which brims with trendy bars and clubs, such as the Velvet Dog and Mercury Lounge.) If you'd rather design your own breakfast or lunch, Constantino's Market, directly across the street from Waterstreet, offers an impressive selection of pre-made items, as well as an assortment of cheeses and gourmet goodies. After breakfast, a walk north on East Ninth Street will take you directly to the lake, where you can spend an afternoon exploring the Rock and Roll Hall of Fame and Museum or the Great Lakes Science Center. Weather permitting, Voinovich Bicentennial Park is an ideal spot for a lakeside picnic, with items from Constantino's Market. Sports fans should plan on scoring tickets to one of Cleveland's three professional sports teams. All of Cleveland's sports venues are within walking distance from Tower City or from hotels located in the historic Gateway District. Baseball fans will want to catch a Cleveland Indians game at the newly named Progressive Field, see the Cavs in action at the neighboring Quicken Loans Arena or cheer on the Browns in the rowdy Dawg Pound seats at Cleveland Browns Stadium. Easy to access, spectator-friendly and rich with tradition, each of Cleveland's major sports venues are a vital part of any quick trip to the city. Celebrate a victory—or drown sorrows—at Flannery’s Irish Pub on Prospect Avenue, the bar that famously offered to buy LeBron his first pint on the occasion of his 21st birthday. If Flannery’s happens to be packed—which is too often the case—check out some of other sports bars and restaurants in the East 4th and Gateway Districts, including the Harry Buffalo or Winking Lizard. Once you've experienced the sporting life, turn to one of downtown Cleveland's fine-dining destinations to soothe and fortify you for another full day. If you choose to stay at The Ritz-Carlton—arguably Cleveland's best hotel—you'll enjoy the hotel chain's legendary hospitality and first-class extras like a fitness center, sauna and elegant lobby lounge. Today, more so than ever, downtown is a destination for gourmets. At the helm of this whirlwind of restaurant activity is Michael Symon, the now-famed Iron Chef of television's Food Network, and his ultra hip and sophisticated Lola on East Fourth. The menu here exemplifies Symon's approach to cuisine, offering playful interpretations of Cleveland staples with a Mediterranean flair and an eye toward underutilized cuts of meat (the beef cheek pierogi are not to be missed). The street also offers a multi-level Mexican restaurant and expansive tequila bar with Zocalo Mexican Grill & Tequileria, Vietnamese cuisine at Saigon, and jazz and small plates at Wonder Bar. For after dinner activities, the lively street is also home to the House of Blues and a bowling alley for the new millennium, the Corner Alley Bar & Grill, as well as Pickwick & Frolic, a restaurant, cabaret, comedy club and martini bar under one roof.